There are moments in life that hold fast like a mosquito preserved in amber. 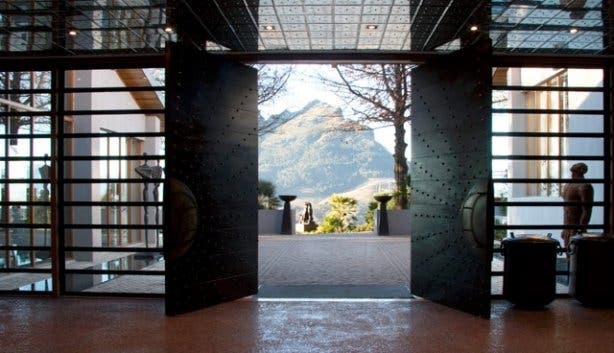 That’s almost how I feel when I walk into the reception of Delaire Graff Estate (on the crest of the misleadingly named Helshoogte Pass). It’s simply a vision: a multitude of exquisite details finely stitched together. For instance, in a more rustic estate the floor could be covered in quintessential peach pits, here, the pits have been inlaid with stone (the floor has the honour of being the largest of its kind in the world). Art is the connecting thread that runs throughout the estate. Prize pieces from lauded South African artists grace the walls, gardens and corners. The work is often challenging, giving you pause as you tour the estate. 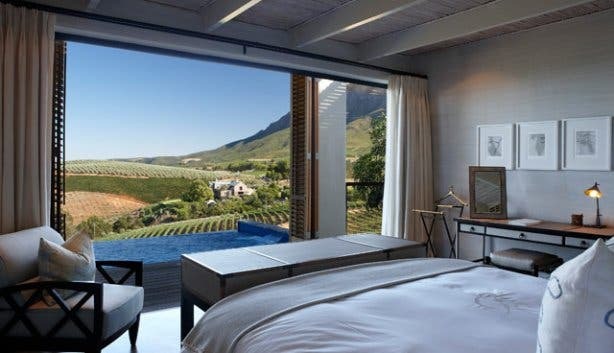 Delaire Graff is a winery, houses two top restaurants as well as high-end retail stores and a boutique hotel and spa. Tanja Mackay-Davidson, marketing manager, tells me it the property wasn’t always this glamorous. “BeforeLaurence Graff bought it, people would buy a bottle of wine and enjoy it under a tree.” In 2003 the Graff name was added to Delaire (previously owned by the Platter family); and just like the jewellery Mr Graff is so famous for, he created a masterpiece. Laurence Graff has built his fortune and reputation on dealing in rare and unique gems. We pass a stand supporting a display case with a yellow diamond the size of a baby tomato. “One of these hats,” says Tanja pointing at a stack of white Panama hats, “takes six months to weave by hand.” We’re in the 100% Capri store, just to the side of reception (and behind the yellow diamond). Our next stop is the Graff Diamond Salon. Indian rosewood walls and floors, and a glittering display. 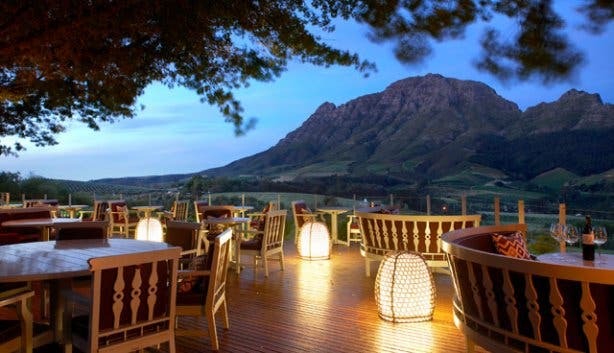 Wewalk across Delaire Graff Restaurant’s wooden deckto our table—ringside to a jaw-dropping mountain view. A server comes past with a basket of hot bread, freshly baked brioche, almond and carrot bread, baguette and more. Skipping the bread we go straight for the oysters, plump and buttery, perfect with Delaire Graff’s chenin blanc. Then onto the beef taktaki: rolled with pine nuts and pesto. Main course is crayfish tail with pan-fried morels, gnocchi and a fragrant bouillabaisse. 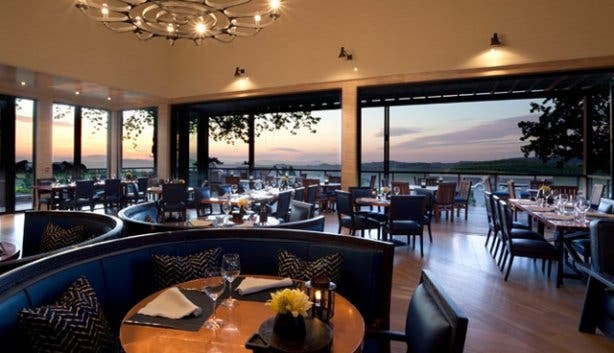 Christiaan Campbell, the executive chef, has created a menu that focuses on local produce and ingredients. The estate has a vegetable and herb garden too, from which Christiaan plucks the finest specimens. Dessert is sublime: pineapple and passion fruit curd, angel food cake, dill, honey crisp, and frozen buffalo yogurt. We pair it with a glass of Delaire Graff port (unctuous and chocolaty). There’s a second restaurant called Indochine. Expect, light, Asian fare in a contemporary style—the restaurant is simply beautiful too, beaten copper tables, indigo seating, and the pervasive scent of lemongrass. 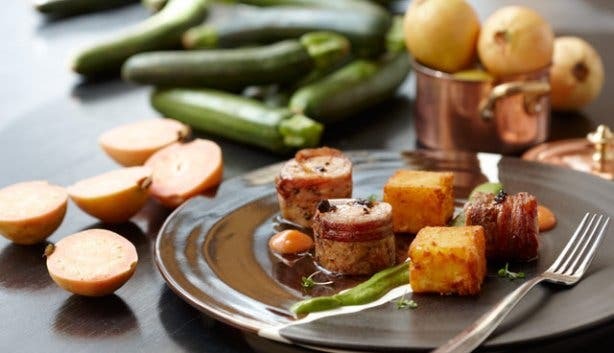 This estate is an island of luxury; whether you’re here to relax at the lodges and spa, eat like a king, or simply sink into a sofa with a bottle of wine. Subscribe to our newsletter, follow us on Facebook and follow us on Twitter. 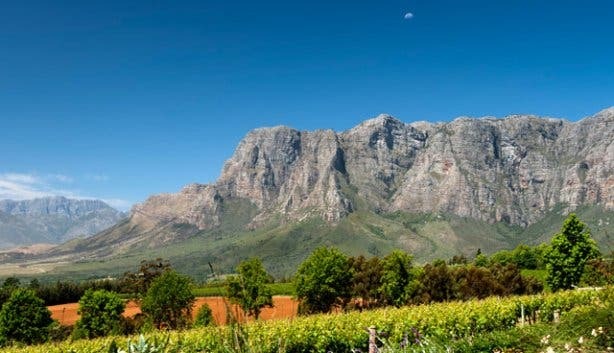 Go here for more things to do in the winelands.